HomeBlogThe BibleHow Many Disciples Did Jesus Have? We all know that Jesus had twelve disciples, right? This number occurs repeatedly in all four gospels. And the first three list them by name. Unfortunately, the lists don’t match. Matthew and Mark list Simon Peter, Andrew, James (son of Zebedee), John, Philip, Bartholomew, Thomas, Matthew, James (son of Alphaeus), Thaddaeus, Simon the Zealot, and Judas Iscariot. Luke matches eleven of these names, but includes Judas (the son of James) and omits Thaddaeus. John doesn’t provide a list but does mention some disciples by name: Andrew, Simon Peter, Phillip, Judas Iscariot, and Thomas. Indirectly included are John and James (“the sons of Zebedee”). However, John also implies Nathanael is a disciple, but he’s not even mentioned in the other three gospels. So that ups the count of disciples to 14. How do we understand this? Nicknames Were Used: If we assume that Thaddaeus was also known as Judas (the son of James) as well as Nathanael, that explains everything, but this is quite a stretch. Some Lists Are Wrong: Matthew and Mark completely agree, so their lists must be right while Luke and John must have each made a mistake. The Group was Dynamic: Though Jesus only had twelve disciples, there was an ebb and flow over his three years of ministry as disciples came and went. Twelve is not an Absolute Number: We live in a culture that assumes precision. If we say twelve, we mean twelve, no more or no less. We don’t mean about twelve or twelve give or take a couple; we mean twelve. I dismiss the first explanation as being too farfetched and discount the second theory as being too convenient. 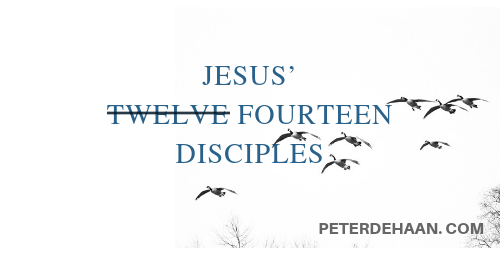 While Jesus’ disciples might have changed over time, it’s more likely that the label of “The Twelve” was a generic reference and not quantifiable.